This home sits beside a cascading waterfall that flows into a small lake. Luxuriate in the peace and serenity. World famous Wolf Creek Golf Course is within a stone's throw. Zion Nat. Park and Bryce Canyon are within easy driving distance. There's incredible hiking trails, kayaking, ATV-ing in this area. Awesome scenery will astound you. Small plane airport less than 1/4 mile and within walking distance of casinos. 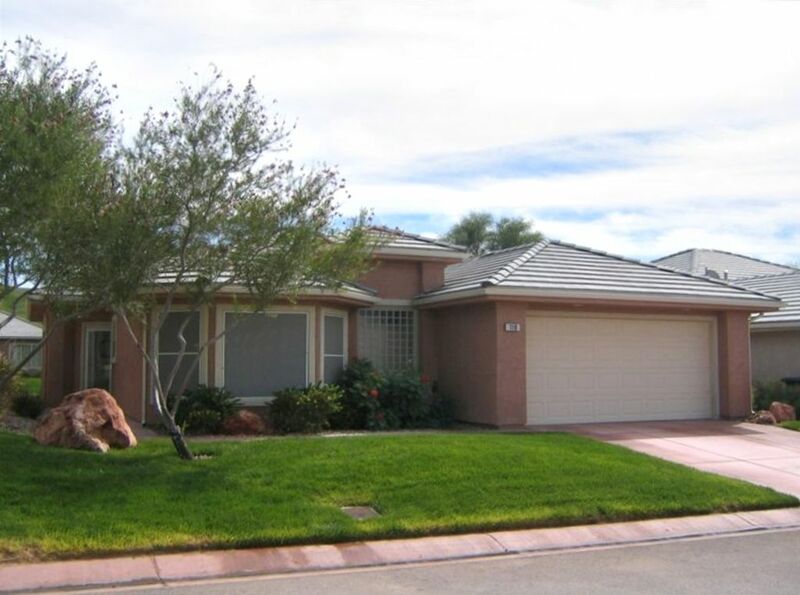 The house is on a hill overlooking Mesquite and the mesa so the views are beautiful. Sunsets are incredible. This home is beautifully decorated with your comfort in mind. As a previous B&B owner my intent is to make sure your stay is as pleasant as possible. This isn't just a vacation rental - it's a home that wraps its arms around you. I grew up in Pa., have traveled extensively in the States and abroad. I owned and operated a B&B in Rapid City, SD before coming to Mesquite so it was natural for me to buy a vacation rental and offer quality accommodations and service here. I chose a rental in this location because of the beautiful and peaceful setting on the waterfall/pond and overlooking the mesa to the west. It sits right beside world renown Wolf Creek Golf Course which is epic in its beauty. The back patio sits beside the waterfall and there's a wonderful view of the sunsets and mesa in the distance from the front. A quiet and peaceful setting. We were privileged to stay in the owners own home. Betty actually has another VRBO property right next store. It’s a lovely place.. We spent most of our time on the large outdoor deck enjoying the waterfowl visiting the adjacent waterfall and pond. Lots of barbecuing and wine! The beds were comfortable and the kitchen had anything you could possibly need or want for cooking - even a springform pan! There is a casita attached to the home which Betty uses to do massage therapy. She asked if she could use it during our stay. No problem for us. It has its own entrance. We never knew when patients were there although Betty always texted us in advance. All in all a perfect place as far as we were concerned. Comfortable home away from home.Amenities at your finger tips and with an accommodating gracious owner/hostess you can begin to count your blessings with a booking. The property is really great. Very comfortable. I especially enjoyed listening to the waterfall in the evening. Very clean and organized. Highly recommended. Betty is a wonderful hostess. The house was very comfortable and clean. We enjoyed our stay very much. The house is beautiful and the owner is very accomodating. She made sure that she sent us a welcome message when we got there. The house is in a great location a couple of miles from the Eureka Casino and also walking distance to Wolf Creek Golf Course Clubhouse. The house was very clean and nicely decorated. We definitely plan on staying here again. This is my second stay at this house. I have quite a bit of experience with VRBO. This is one of the best ever with a fully equipped kitchen, quiet neighborhood, pleasant and peaceful landscaping, very very clean and well furnished. A great escape from Las Vegas. And the golf course is magnificent. Had a problem with wifi, Betty took care of it as quickly as possible. She's the best. I will be staying here again, and I highly recommend it. Close to Zion Nt'l Park, Lake Mead, Valley of Fire. 80 mi. NE of Las Vegas. 9 beautiful golf courses, Casinos, ATV trails.